I happened to work for the printed media on many occasions, for different targets and on different formats and products. Here is a sample of my work, mainly for illustrating the different kinds of product I designed (I skipped the many flyers I did…). In my current position at SUPSI-DFA (since 2013) I coordinate institutional communication, and we produce a lot of printed media stuff. For this, I now team up with a professional graphic designer. Product. A bi-jearly institutional newsletter of the Dipartimento formazione e apprendimento. Still ongoing. My task. Editorial project, authors coordination, text editing. For issue 0: layout design (then improved with a graphic designer), pictures editing and composition. Product. 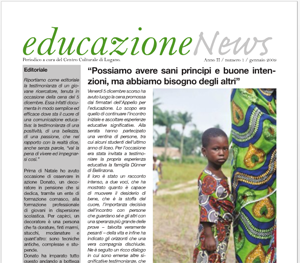 A monthly PDF newsletter (1 page A4, 2 sides) on education and society (4 issues). My task. Layout design, composition, text editing. Client. Centro culturale della Svizzera italian (volunteer work). View. All issues available at http://centroculturalelugano.blogspot.com. Product. 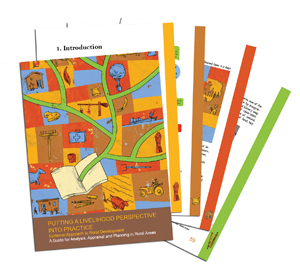 Training manual (76 pages) for rural development experts in developing countries. My task. Layout and graphic design, composition, text editing, management of printing process. I collaborated with a graphic artist for illustrations, and selected proper paper and binding for in-the-field use. Produced with Adobe InDesign. Client. Work done for seed, on a contract with Intercooperation, a large Swiss NGO. Product. 27 exhibition posters (100×100 cm), organized in three sections. My task. Layout and graphic design, composition, text editing, management of printing process, on-site installation. 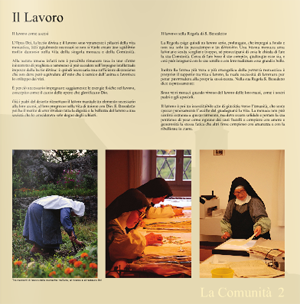 The exhibition was completed with a maquette of the monastery, a 10′ video and an interactive application. Produced with Adobe photoshop and Macromedia Freehand.